Eeek! You know that feeling you get when a space turns out exactly the way you envisioned it?! Ahhh I’m SO excited! 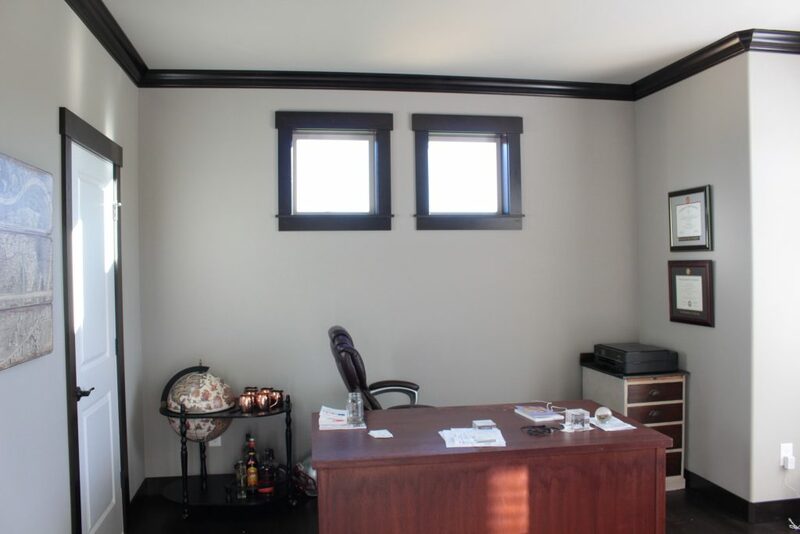 Just about 6 weeks ago, I started decorating my husband’s office. 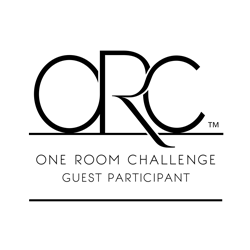 I was hoping to complete the entire makeover in 6 weeks for the One Room Challenge but I ran into several road blocks along the way. I have a very specific look I wanted for this room and almost everything I ordered was delayed and I didn’t want to settle for anything else. SO it’s been a little bit of a longer process. I’m still waiting on several big ticket items for this space, so today I’m showing you our Rustic Office Mini Reveal! 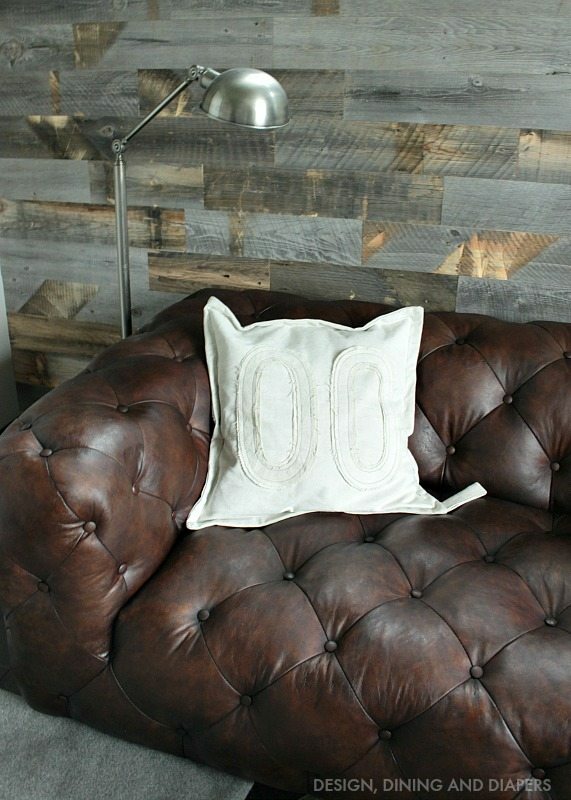 One of the big projects for this room was adding a reclaimed wood wall. 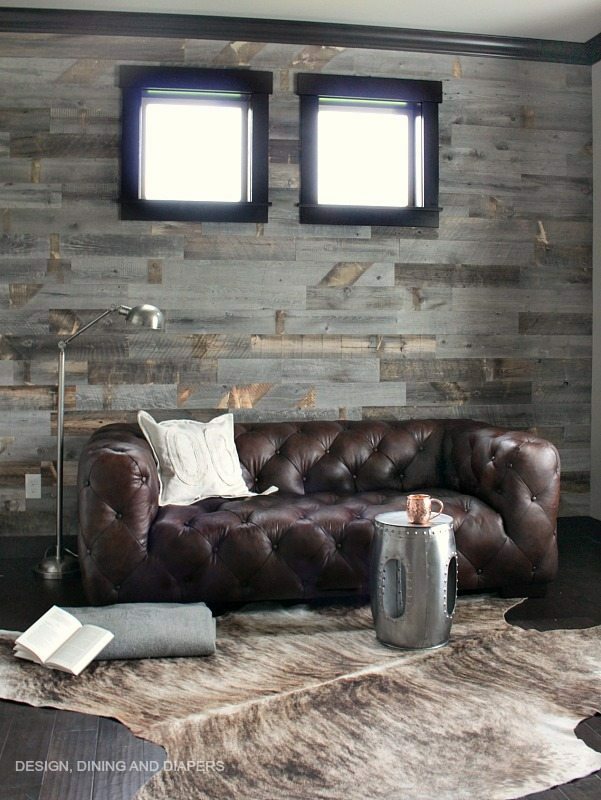 I wanted a real masculine, rustic look for this space and this Stikwood Wall was the perfect addition. Seriously. In love. Move over husband, I’m about to steal your office (as if I don’t already, ha!). Gah! I just love it so much. 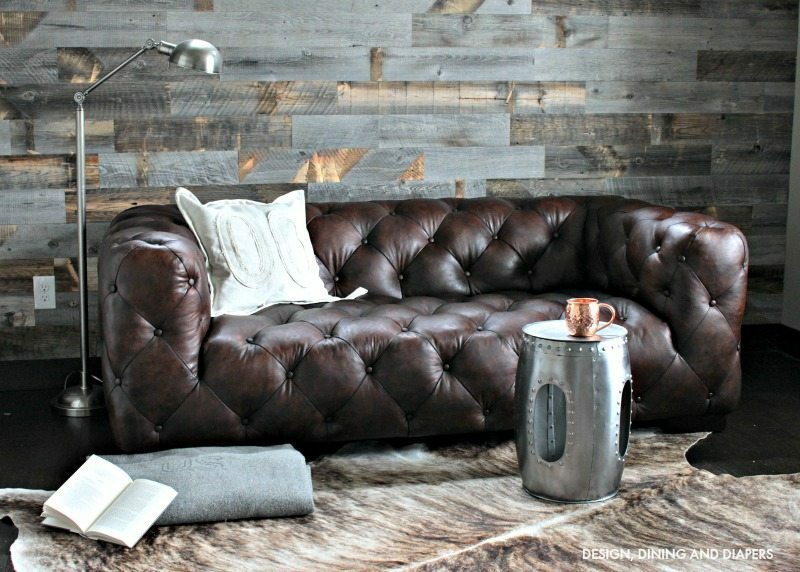 I have dreamt of having a tufted brown leather sofa for years and years and this was the PERFECT space for one. I am so glad I finally took the plunge. This will be a piece we have forever. If you haven’t heard of Stikwood, they crated the first peel and stick wood planking and wall art. 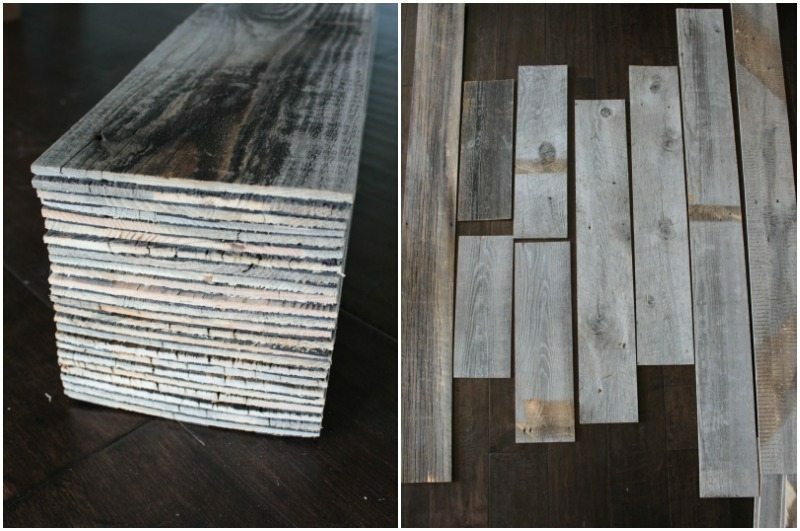 All of the planks are made from reclaimed and sustainable woods from around the U.S., There are several different looks you can choose from, I went with the Reclaimed Weathered Wood and it’s perfection. It’s mainly gray tones with flecks of browns. The whole process was relatively easy. It took me awhile to make all of the cuts that go around the windows. Aside from those, the process was super fast. If you were doing a solid wall with no windows or pieces to work around, I think you could get the whole thing done in 3-4 hours or less. One of the reasons why it took me so long to start decorating this space were those two windows. I wasn’t sure how to decorate around them. Do I put bookcases on either side? Complementary artwork? Or will those windows just look awkward in-between? And then I came across Stikwood and it was the perfect solution. The wall is so rich and full of character that I don’t need to worry about decorating this wall at all. The wood is beautiful as-is. So are you ready to see what the room looked like before? Here is our previous, very basic office with barely anything in there. In fact, this is actually a better ‘before’ photo because I actual hung a few things on the walls once the challenge started. To get started, I measured my wall to determine how much wood I would need and then placed my order! The wood arrives in neat and tidy stacks like the ones above. The wood is actually really thing, only about 1/4″ thick and has 3 adhesive strips on the back. You just peel and stick and occasionally cut. Since all of the pieces are different sizes and color tones, I recommend opening up all of your boxes first and seeing what you have to work with. Each of my boxes were very different and this helped me blend all of the pieces. The bulk of my time went into cutting the pieces around the windows. I started on the top and worked my way down. Another reason why you will want to lay all of your pieces out is that more often that not, you will probably find the exact size piece that you are looking for already in your pile. This saves lots of time cutting and saves wood! If it wasn’t for the windows, I wouldn’t even recognize this space. I’m amazed at the transformation. 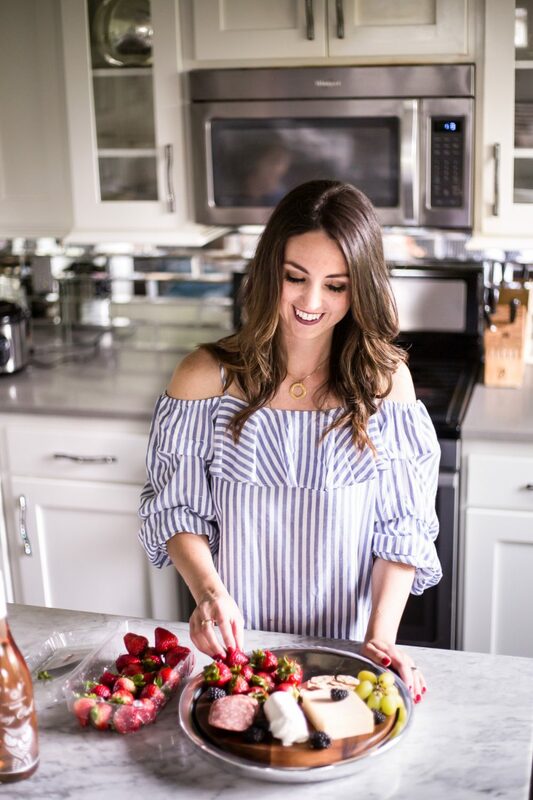 If you are interested in trying it in your own space, be sure to follow Stikwood on all their channels (Facebook, Instagram, Twitter) for tons of inspiration. What’s even more exciting is that I’m not done with the space. The desk, lighting and other details are coming soon! But for now, hope you enjoyed the Mini Reveal! Disclosure: Stikwood provided me with the wood to review for this post. Ahhh! This turned out gorgeous, Taryn! I just got that exact same Stikwood for our kitchen, so this makes me even more excited to get started on installing it. That couch is AWESOME! Can’t wait to see what other items you’ll be bringing in here. Wow! 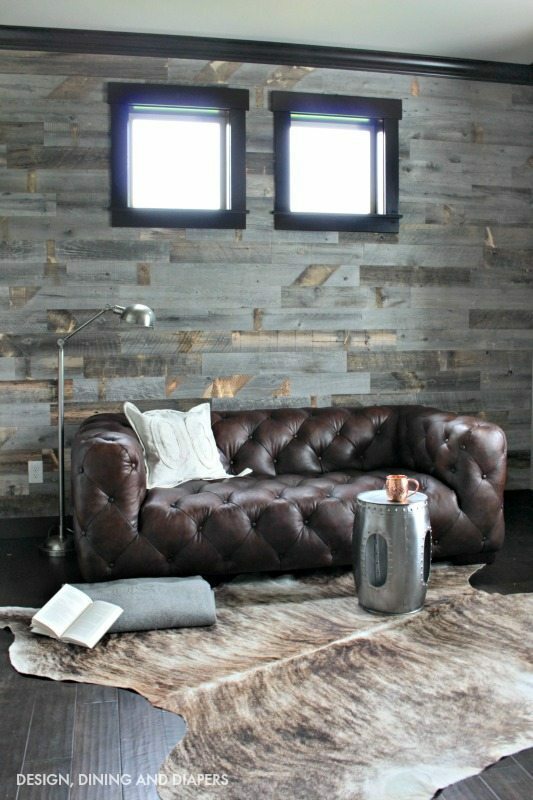 The wood wall really transforms the room!! It’s beautiful! Wow, that wall looks great! This is the second time I’ve seen their products used in a room and both times I was super impressed. Can’t wait to see the rest of your makeover! 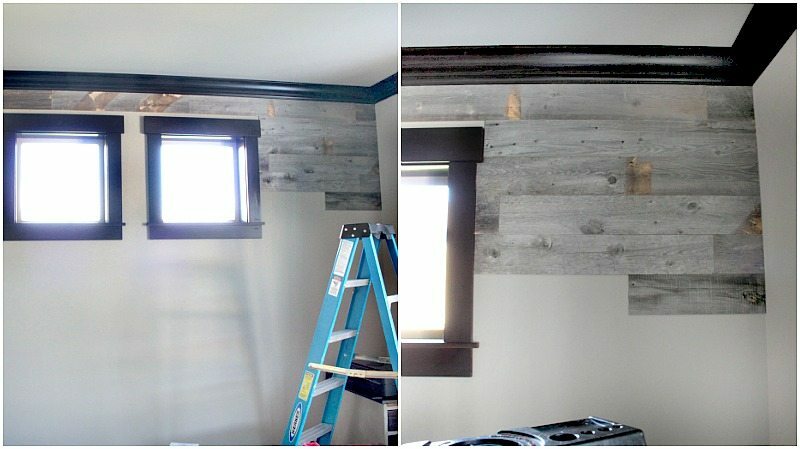 love the stikwood wall, wish we weren’t in a rental. :( Love the couch too! 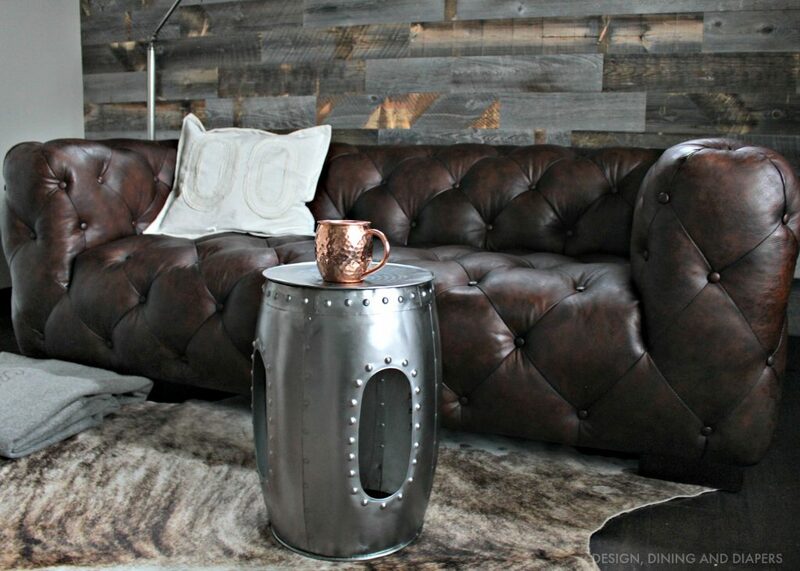 Love the rustic/industrial vibe to your space! that wood wall treatment is fantastic! Congrats and CHEERS to us for another room done! Wow, this wall treatment of wood is great! I haven’t heard of this peel and stick wood before. What did you use to cut it with? ie: a razor knife or jigsaw or what? It’s so thin, I was thinking that maybe a straight edge and blade would work on it? 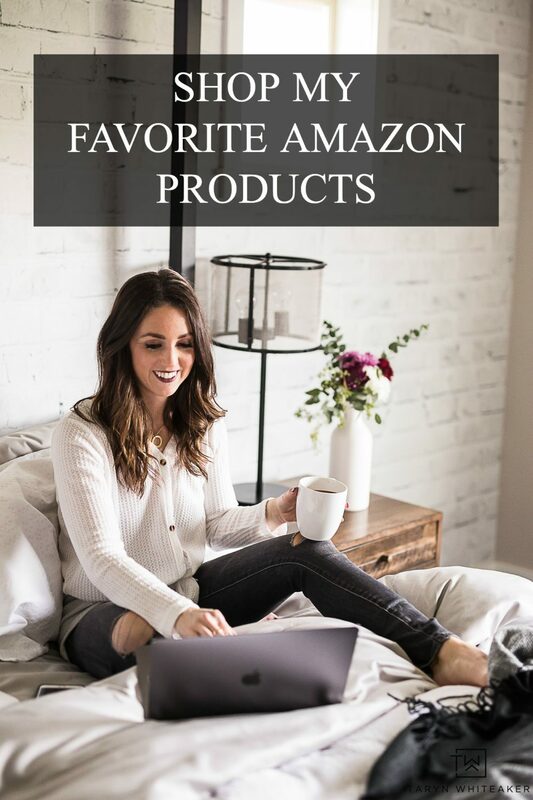 What a great product! Hi! I used a small circular saw and it worked perfect. The company also has a page on their site for cutting recommendations. It was super easy to work with! Fantastic! I’m so happy you shared with us! Wow! What a great space! Who knew something so simple could make such a big difference! Thanks for sharing! Love it! I agree, that I would be like you and want the space for myself! 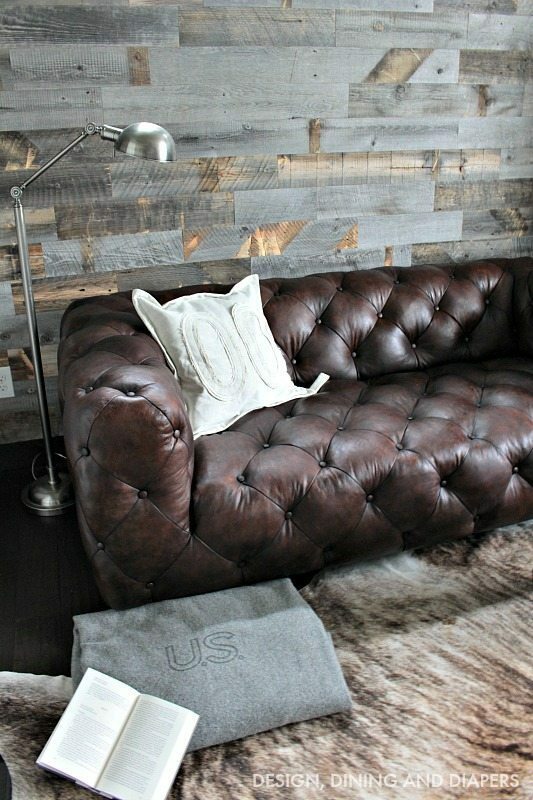 Love how the barn wood looks with the couch, rug and other decor and that you left the black trim around the windows.